Last Wednesday (October 25th) we welcomed almost 100 practitioners from across Scotland to the SQA Digital Question Paper Focus Group. This annual (free) event again provided a great opportunity for staff to meet with colleagues from other schools and to discuss the use of technology in examinations with representatives from SQA and CALL. The morning began with a discussion stimulated by a set of 'myths and legends' about the use of digital technology by learners with additional support needs in examinations. These were devised by Patricia McDonald and Annette Foulcer of SQA and include questions about arrangements such as "SQA can only provide Digital Question Papers as an assessment arrangement for disabled candidates and/or those identified as having additional support needs." as well as questions about the technology (e.g. "Candidates cannot use the Digital Question Papers to use text-to-speech software to read back their responses"). I suggested one or two questions, including "John Swinney will personally mark all examinations scripts in 2018", but they didn't make it into the final list for seome reason. Why not download the questions for yourself, and then check your answers. We then turned to an overview of the uptake of Digital Question Papers in 2017. SQA would rather the slides with data are not published and so I can't share them here. In 2017, there were increases in the number of requests for Digital Question Papers and for use of ICT (i.e. a word processor without DQP), from more schools and centres, and for more candidates. For the first time, SQA received more requests for DQPs than for the use of a scribe. SQA are keen to remind colleagues that these figures are not validated - a request for a particular assessment arrangement does not necessarily mean that the candidate actually used the arrangement in the examination - but nevertheless, the trends do suggest that use of technology is increasingly common as an Assessment Arrangement. Fonts becoming smaller in some answer boxes. The answer boxes are a fixed size on the paper - this is a characteristic of the PDF and it is not possible for the boxes to expand as more text is type in. Therefore, either we limit the number of characters that can be typed in, or we enable candidates to type in more text than the box can display, with the result that the font size reduces. The digital papers are designed to allow the latter, so that candidates have the option of typing in a little more text. It's important to alert candidates that the size of the answer box is a guide to the length of answer required, so if the text size starts to decrease, the answer is probably too detailed. Reading mathematics and science expressions with a computer reader. Although computer readers with the Scottish voices can read some STEM expressions accurately (e.g. 40 cm, 15°), more complex expressions cannot be read out correctly. There's not a lot we can do about this. 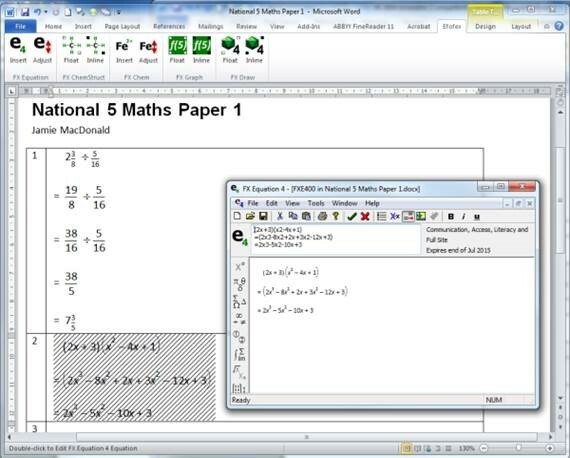 MathML is a technology for rendering maths expressions digitally, so they can be read out by a computer with for example STEM Reader, but it is not yet possible to insert MathML into the PDF question papers. Writing mathematics and science expressions. Likewise, there was a question about generating STEM expressions on a computer. We have some guidance our web site and for Windows computers, we suggest looking at the software from Efofex such as FX Equation, or Splash Secondary, a maths program specifically designed for learners with additional support needs. Neither of these packages work with the Digital Question Paper PDFs - Efofex is used within Word, while Splash is a standalone program. The 2017 DQPs are now available for download, for practice and revision, from SQA's Digital Question Papers pages. 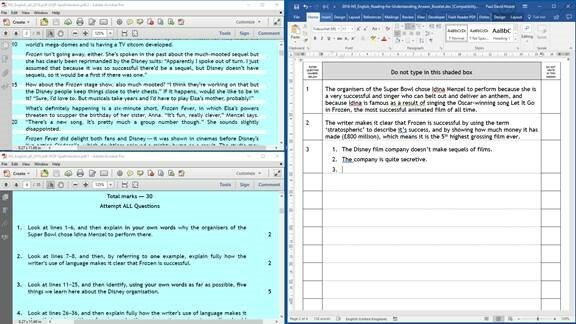 Some question papers are in a 'question and answer' format, where the papers have answer boxes for typing in on screen. Other papers are 'question only' - they do not have answer boxes - and so the candidate has to write their answers either with a word processor or a 'Digital Answer Booklet' (DAB). SQA provides DABs in both PDF and Word format on their web site. There are pros and cons with each format - from the discussion it was evident that some schools and candidates prefer to use the PDF versions, while others prefer to use the Word files. Is the use of DABs compulsory? No - SQA prefer candidates to use DABs because the printouts can be electronically scanned and processed, but learners can just use a word processor if the DABs are not accessible or suitable. For example, the Word format DABs do not work correctly on Google Docs on Chromebooks or on Pages on the iPad. PDF DABs. Can the text on a PDF DAB 'flow' from one page to another? No, unfortunately this is not technically possible. Word DAB format. At present, the Word DABs are 'doc' files. This can cause error messages and confusion when opening the files with newer versions of Word 2007, and on Word on other devices such as iPads. The newer 'docx' can be opened with Word 2007, so the group was asked if they would be happy if DABs were made available in the newer docx format - this was agreed. Word SCN fields. The DABs have a facility for the Scottish Candidate Number to be copied to pages of a DAB: the group felt that the current mechanism was satisfactory. Chromebooks are now being purchased by schools and local authorities in relatively large numbers, and so SQA have funded CALL to carry out some investigation into the use of Chromebooks in examinations. Paul presented the findings so far and you can download the presentation. At the present time, the accessibility options and the apps and extensions that are available for Chromebooks are not as good as those available for Windows computers or iPads. Chromebok apps for accessing the DQPs do not have quite the same range of features and functions, while Chromebooks cannot use the free Scottish computer voices. However, the technology is developing rapidly and we intend to run a free morning seminar at the beginning of 2018 where we will explore what is possible with Chromebooks and examinations. We are very keen to speak to colleagues who have already implemented Chromebooks in schools, and so if you like to collaborate with us on this investigation - for example if you're intending to use Chromebooks for the 2018 examination diet - please get in touch. There was discussion about whether it would be appropriate for any candidate to request the use of a digital paper. At the present time, DQPs are provided by SQA as an Assessment Arrangement, for candidates who have difficulty with the traditional question paper, and they are not provided for other candidates. When will examinations by done completely online? There was an interesting discussion about the paper-based examination system, and whether SQA examinations would ever be provided on-line. e-Assessment is already used for some types of assessment both by SQA, and by other awarding bodies, but we are a long way from it becoming the standard method. My personal view on this is that it would be impossible to run, for example, National 5 English completely on-line at the same time on the same day, because there are simply not enough computers available in school, and the average school Internet provision is not reliable enough. However, there is a lot of work going on - for example BTL, who developed the SQA Solar assessments, now offer Surpass, which is an "assessment platform for the secure management and delivery of paper based and on-screen examinations and tests". 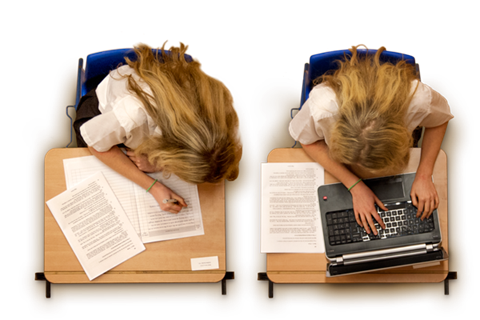 Last year SQA did conduct a trial of Surpass Paper+, which you can think of as an online DAB, but I believe that there were quite a few problems with administering the assessments in schools. I think the only way that examinations will ever be done on-line will be to completely rethink the nature and design of the SQA external examinations and devise e-Assessments with an item bank of graded, adapted questions so that candidates can take the assessment on different days and at different times. e-Assessment can result in reduced costs, faster turnaround through automatic marking (but do we want English essays graded by a robot? ), and less paper, but the implications have to be thought through carefully. At the end of the morning, Fiona Marsden, Senior Operations Manager at SQA summarised the Key Messages from the event. We would like to build an online community of practice where we discuss the use of technology for learners with additional support needs in examinations. If you're interested in contributing to this, perhaps you could add a comment below? In particular, I'd like views on how best to go about it - should it be via an email forum; Yammer; Facebook; Twitter: etc? Answers not on a postcard please.